“The only real power comes out of a long rifle.” – Joseph Stalin. 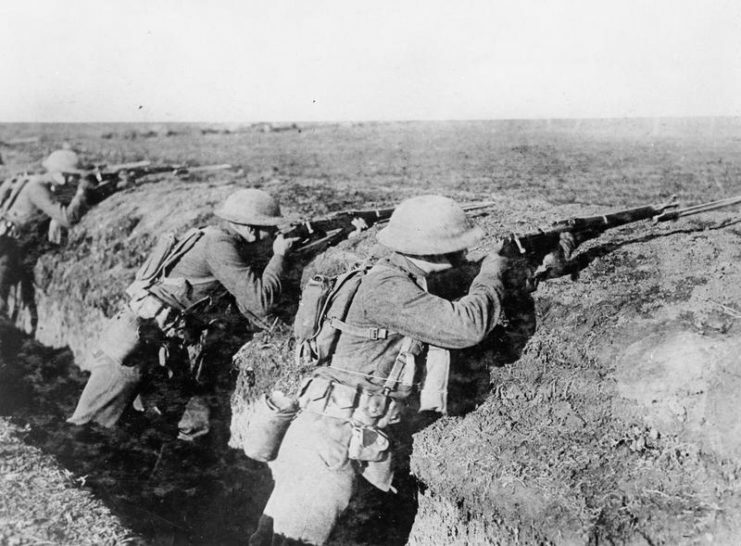 During WWI, millions of men were given rifles and sent into the trenches to fight. They were the weapons that turned civilians into soldiers. Machine-guns and artillery might have defined the war, but the rifle was a soldier’s constant companion. 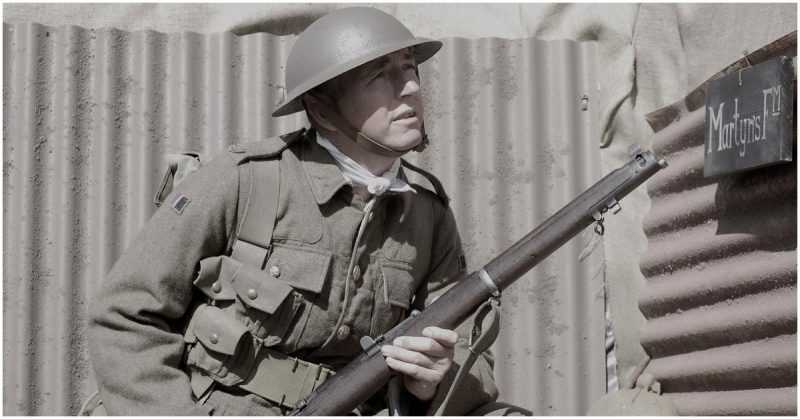 On the Western Front in particular, what made for a good rifle changed. Sitting in trenches for months at a time, enduring the terrible weather, then fighting in rushed advances and brutal close combat, men needed a rugged weapon that could take a battering. A high rate of fire was essential. The range was less critical, guns needing to be accurate to 400 yards rather than the pre-war goal of 800 yards. A short weapon was better, as it was easier to wield in a confined trench. Did the leading weapons live up to those standards? Going into the war, the British had a weapon that met the requirements. Rifle No.1 Mk III was the latest variation of the Short Magazine Lee-Enfield Rifle, which had been brought into service in 1907. It had been developed during the Boer War when the British found their standard rifle too long for cavalry use. It led to a hybrid weapon whose shortness proved valuable although the cavalry it was made for became obsolete. Although its rear-lug locking mechanism was, in theory, weaker than those of some other weapons, it worked smoothly and gave users minimal trouble. It’s smooth reliability allowed British soldiers to achieve remarkably high rates of fire. The magazine carried ten powerful 0.303-inch rounds. Modifications were made to the weapon, stripping away features meant for range and precision. It made the rifle easier to produce, a vital factor when so many men needed to be armed quickly. The resulting No.1 Mk III* was so efficient it stayed in service throughout WWII. Like the No.1 Mk III, the American Springfield Model 1903 was a compromise weapon, somewhere between a traditional rifle and the carbines of the period. It had a Mauser mechanism, the best available in the world, produced under license at the Springfield Arsenal. As a result, it had a bolt action that was easy to use. Nicely balanced, it was more accurate than most rifles of the period, firing to target-shooting standards. The Springfield had a five-round box magazine carrying 0.3-inch caliber bullets. With a muzzle velocity of 2,800 feet per second, it was more powerful than the No.1Mk III, but not as fast firing. US Marines with M1903 rifles and bayonets in France, 1918. Going into WWI, the French suffered from the same problem they had in the Franco-Prussian war 44 years before – their weapons were inferior to those of their opponents. The standard French weapon was the Lebel Model 1886. As its name implies, it was older than the weapons of France’s allies. Its tubular magazine, which carried 8mm caliber bullets, was slow to load. At 13.4 inches long, it was over half a foot longer than the Springfield and the No.1 Mk III. Its tendency to explode made it a danger to its users. Other French weapons had their problems too. The Berthier Model 1907 added a box magazine to the Lebel, but it still only held three rounds. The Berthier and Gras carbines were shorter. Combined with powerful bullets it gave them excessive muzzle flash, and like the Berthier 1907, they only had small magazines. The Belgian Fabrique Nationale went on to become one of the leading weapons manufacturers of the 20th century, but at the start of WWI, they were still finding their feet. The FN-Mauser Model 1895 was an unremarkable weapon, although an adequate one for the ordinary Belgian infantryman. It was long, especially when equipped with its large bayonet. Its five-round magazine carried 0.301-inch ammunition, almost the same as the British were firing. Before Communist governments created a doctrine of mass mobilization, the Russians were fielding a weapon suitable for that strategy. The Mosin-Nagant Model 1891 was unexceptional but sturdy; a weapon that could take a battering in the hands of inexperienced soldiers. Like the FN-Mauser Model 1895, it was a relatively long weapon with a five-round magazine. Its 7.62mm ammunition was slightly smaller than that of the Belgian gun. 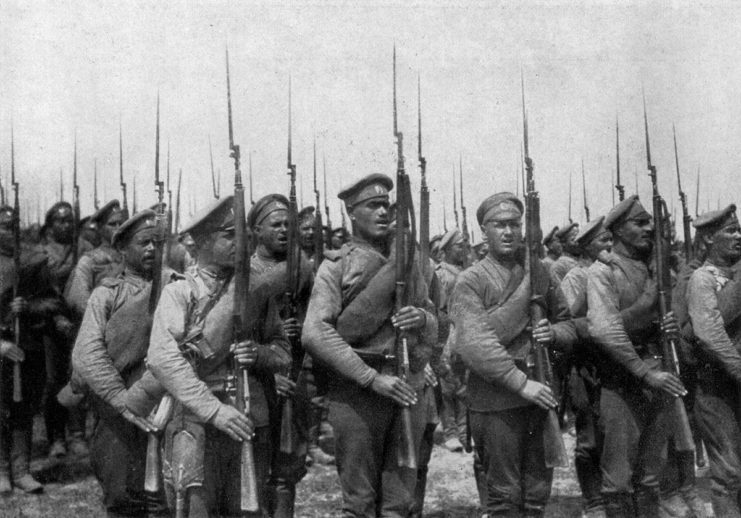 Russian Imperial infantry of World War I armed with Mosin–Nagant rifles. The Fucile Modello 91, also known as the Mannlicher-Carcano, was the standard weapon of the Italian army. It was another long weapon and an underpowered one, firing 0.256-inch caliber bullets with a muzzle velocity of 2,067 feet per second. Its only advantage was a six-round box magazine. Germany had a strong tradition of superior weaponry. They fielded one of the best rifles of the war. The Gewehr 98 was a Mauser creation. Its three-lug front-locking system was not as smooth as the mechanism on the No.1 Mk III. Together with the five-round magazine, it gave German infantry a slower rate of fire than British Tommies. It could still put out as much firepower as most rifles of the period. Its biggest drawback was its 49.2-inch length. Critically, the Gewehr 98 was incredibly sturdy and consistent. 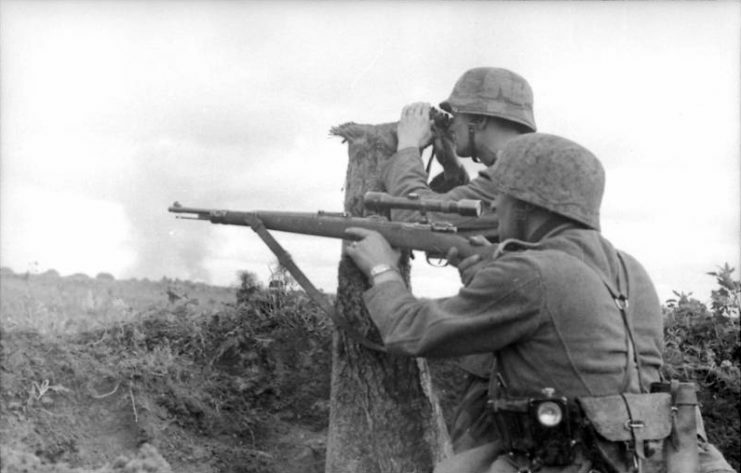 Superior manufacturing meant that, even as Germany struggled for resources later in the war, the rifle was always reliable and could take a battering in the trenches. Austro-Hungarian troops carried a very similar weapon to their German allies. The Mannlicher Model 1895 was another long bolt-action rifle with a straight pull mechanism. The integral five-round magazine was filled with 8mm ammunition. It was an effective, reliable weapon that was widely used in southern and eastern Europe and was influential on later weapon design.